Cody Thomas was living his dream and doing everything he could to keep from waking up. The reality of his situation as a two-sport athlete at the University of Oklahoma, however, forced him to make a choice he hoped he'd never have to make. "My goal was to be a two-sport star in the pros," the Dodgers outfield prospect said. Three years after he revised that goal -- electing to wave goodbye to the gridiron in favor focusing on his development on the diamond -- Thomas is coming off a breakout season and playing for the Glendale Desert Dogs among baseball's top prospects in the Arizona Fall League. "I was a good athlete growing up, but baseball was always the first choice for me," he explained. "It was the first sport I took an interest in and the sport that has always been there for me. I was in a kid-pitch league with my older brother [Brandon] when I was six years old and I played [at a higher level] pretty much my entire life. I didn't even play organized football until middle school." Baseball's appeal runs deep in the 24-year-old's hometown of Colleyville, Texas. But the Lone Star State has long been and continues to be a bastion for amateur and collegiate football. The Dallas-Fort Worth suburb is no exception. Thomas excelled in both sports at Colleyville Heritage High School. The Yankees, intrigued by his talent and projectability on the diamond, selected him in the 30th round of the 2013 Draft. But it was his right arm and performance as a quarterback that vaulted Thomas into the national spotlight. He passed for 7,603 yards and 82 touchdowns during his junior and senior seasons at CHHS, catapulting him up the ranks of four-star recruits. The decision he faced -- attend Oklahoma on a football scholarship or accept a minimal bonus as a 30th-round Draft pick -- was a fait accompli. He was off to Norman. "I played both sports my freshman year at OU," Thomas said. "To be honest, I was getting a little burned out on baseball after playing in high school and on travel teams. When you add in the long hours you need to dedicate towards football, especially at a program like OU ... it was hard." After redshirting as a freshman during the football season, in the spring Thomas appeared in 14 games and produced one hit across 12 at-bats. The multi-sport approach was much tougher than he'd expected. "I would do football workouts and then go to baseball practice for a few hours in the spring," Thomas said. "It was tough all around. I was showing up to baseball and sitting on the bench. Then when spring practices started for football, I had to start juggling both. I ran myself into the ground, basically. It was tough on me mentally and physically, and I told myself I'd never do that again if it was going to be that way." Thomas spent the 2014 football season as a backup to Trevor Knight but did appear in seven games, making three starts. But when spring rolled around and baseball began, the sophomore once more found himself feeling overwhelmed by the demands of competing in two sports. It was time to make a decision. "I let baseball go that year," he said. "I was starting to realize I might need to put all of my eggs in one basket if I truly wanted to win the starting QB job. Being there on a football scholarship, I wasn't able to give baseball the same attention or effort and trying to play both was draining, physically and emotionally." "I started to believe that this was where I needed to be. God was telling me something. ... With baseball, I tasted some success and the timing seemed right again. My heart was back in it." Thomas found himself backing up Knight again the next fall. He made three appearances for the Sooners, including a cameo in the school's Orange Bowl loss to Clemson on Dec. 31, 2015. Sensing his opportunity to be Oklahoma's No. 1 quarterback slipping away, Thomas went home and thought about grabbing his bat and glove once again. "I didn't want to sit there all semester and only concentrate on school," he said. "I called [Sooners baseball coach Pete Hughes] and asked if I could come back out to play. The NCAA was actually holding a roster spot against them because an incoming freshman had quit. I found out on Opening Day that the spot was cleared and I was able to join the team"
After being away from the game for nearly two years, he got off to a predictably slow start. But it didn't take long for his talent to break through. "I started out playing regularly but I was struggling," Thomas said. "My playing time decreased, but around the halfway point of the season, I began to turn things around and felt comfortable. I started to believe that this was where I needed to be. God was telling me something. I really hadn't had much success playing football and I was a backup for so long. With baseball, I tasted some success and the timing of things seemed right. My heart was back in it." Thomas earned All-Big 12 Honorable Mention after hitting .299/.354/.556 with 16 extra-base hits, 27 RBIs and 26 runs scored in 40 games for the Sooners. The Dodgers came calling in the 13th round of the 2016 Draft and this time Thomas didn't decline the offer. "It was probably during the Big 12 tournament where I had a feeling I might get drafted," he said. "Everything seemed like it happened so fast. I wasn't playing much, then I was and I sort of took off from there." Thomas was assigned to the Dodgers' Rookie-level Arizona League affiliate that summer before he moved on to Rookie-level Ogden. He thrived in the Pioneer League, bashing 16 homers and driving in 44 runs in 52 games for the Raptors. Overall, he went deep 19 times and collected 50 RBIs in 59 contests. "The biggest difference between the pros and college is playing every day," Thomas said. "That goes double for me, since I was mostly [a designated hitter] with Oklahoma and now I was playing every day in the outfield. But the jump wasn't too big of a deal from a competitive standpoint. Both leagues were great for hitters and great places to play for a first-year guy." Los Angeles bumped Thomas up to Class A Great Lakes the next year. His power remained for his first full season, but his consistency wavered. Despite going deep 20 times -- including a three-homer game on Aug. 3, 2017 -- he batted .222/.293/.409 and struck out 150 times in 121 games. "Everyone says that first full season is unlike anything you've ever experienced," Thomas said. "You have no idea what it's like until you go through it ... and that's true. A lot of stuff happens over 140 games. A lot of adjustments need to be made and you need to let the bad stuff go and not let it snowball. I needed to make some adjustments with my swing coming off  and that's what I did. The whole year was a learning experience." 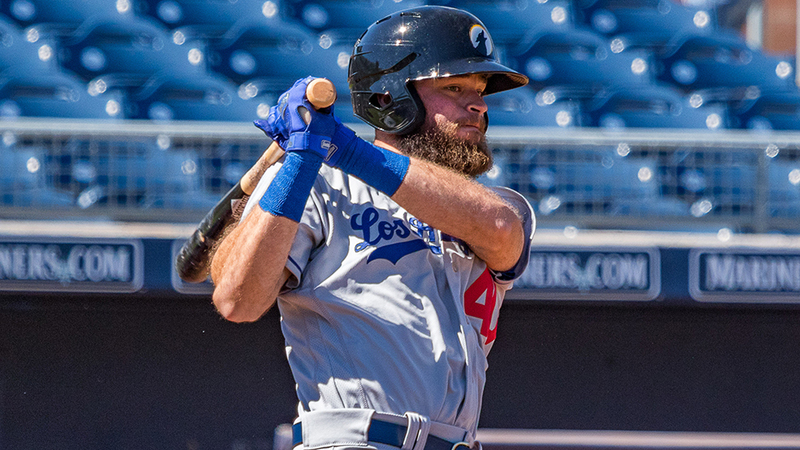 The Dodgers promoted Thomas to Class A Advanced Rancho Cucamonga to begin 2018. It was there, approximately 50 miles from Los Angeles, that the former football sensation blossomed into a legitimate baseball prospect. Thomas used a second-half surge to finish at .285/.355/.497 with 19 homers, 87 RBIs and 61 extra-base hits. He slugged a first-inning grand slam in Game 2 of the California League Finals and hit .333 with a pair of roundtrippers and seven RBIs in seven postseason games to help the Quakes win their second championship in four years. "We had a great team," Thomas said. "A great team -- with great camaraderie -- that had a lot of fun. When everyone is having success and having fun, it seems to make everyone better. That's what happened with us this year." With the Desert Dogs this autumn, he's been able to rub elbows with players from other systems. Although his regular-season success hasn't carried over, Thomas is soaking up all he can on the instructional circuit. "It's been fun to play in the AFL," he said. "The talent level is unbelievable. A lot of these guys have already played in Double-A or Triple-A and some have been to the Majors. Getting to face them and compete against them is great for me. It allows me to get a glimpse of what I have to look forward to and also learn how other organizations teach their players." As he winds down his third professional season and begins to prepare for his fourth, Thomas realizes that he's inching closer to achieving his dream, albeit one that has undergone a few alterations along the way. "I wanted to play and excel at both [football and baseball], but God had other plans for me," he said. "I realized that football wasn't going to work out. I gave it my all and loved playing, but it just felt right when I went back to baseball. I played both until I felt it was the right time to change. "I think it was a good thing I took some time off [from baseball]. I appreciate playing so much more now. Stepping away made me fall in love with the game again. Looking back, I wouldn't have done anything different."